Hanora Veronica Houghton married Charles Edward Forbes. Charles Edward Forbes married Hanora Veronica Houghton, daughter of Patrick H. Houghton and Ellen Frances Buckley. Patrick H. Houghton married Ellen Frances Buckley in circa 1889 mar 11 years in 1900 census. Ellen Frances Buckley married Patrick H. Houghton in circa 1889 mar 11 years in 1900 census. Marriage Oct 8, 1928 Brockton, Plymouth Co., MA, USA, Oakdale St.
Walter John Houghton married Zipha Ruth Davison in Oct 8, 1928 at Brockton, Plymouth Co., MA, USA, Oakdale St.
Richard Carl Houghton married Annette P. Menard in Nov 30, 1952 at Holy Family Church, Rockland, MA, USA. Richard Carl Houghton and Annette P. Menard were divorced. Roger Houghton married Donna Chaves in May 26, 1984 at Taunton, MA, USA. Roger Houghton married Elizabeth Agnes Bright in May 3, 1996 at Middleboro, MA, USA. 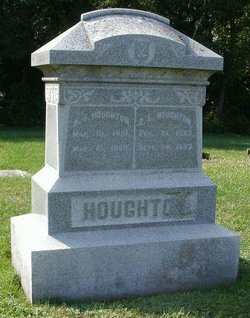 Alphonzo J. Houghton married Anna Matilda Lore in 1861. Anna Matilda Lore married Thomas Price in 1849. Anna Matilda Lore married Alphonzo J. Houghton, son of Abel Houghton and Mary R. Sargent, in 1861. Anna Matilda Lore married Cyrus B. Carpenter in 1871. Matilda (?) married James Howton. Mary (?) married William Howton, son of James Howton and Matilda (?). Mary Howton married John Roberts. John Roberts married Mary Howton, daughter of James Howton and Matilda (?). Sara Ann Houghton married Roland Walter Dunn. Roland Walter Dunn married Sara Ann Houghton, daughter of Reynolds Edwin Houghton and Sara Leslie France. Dr. Elijah Reeves Hooten married Ellen Amanda Bills in Jun 1, 1837 at Marshall Co., TN, USA. Dr. James Walker Hooten married Martha Ann Testerman in May 30, 1860 at Sulpher Springs, Hopkins Co., TX, USA, Jan 4 1860 also. Martha Ann Testerman married Dr. James Walker Hooten, son of Dr. Elijah Reeves Hooten and Ellen Amanda Bills, in May 30, 1860 at Sulpher Springs, Hopkins Co., TX, USA, Jan 4 1860 also.